Unique technology can give manufacturers that all-important competitive edge, an advantage which becomes that bit sharper if you can also incorporate environmental considerations into your product. All these benefits are wrapped up in an exciting new antifouling developed for the yacht market by our Marine and Protective Coatings business. Targeted for both retail and professional customers, Micron WA – part of the industry-leading International Paint range – uses pioneering water activated matrix technology to deliver outstanding multi-seasonal protection in high challenge areas, in all types of waters. It combines powerful antifouling performance with a very low VOC to provide the perfect solution for customers looking for a premium quality, brightly colored antifouling which can also reduce their environmental impact. The product dries to a finish unlike a conventional antifouling and, before immersion, the color may even appear dull. But once immersed, a uniform finish and bright color develops as water filters through the matrix, saturating the pigments while at the same time efficiently releasing the active ingredients to deliver powerful fouling deterrence for up to 24 months. 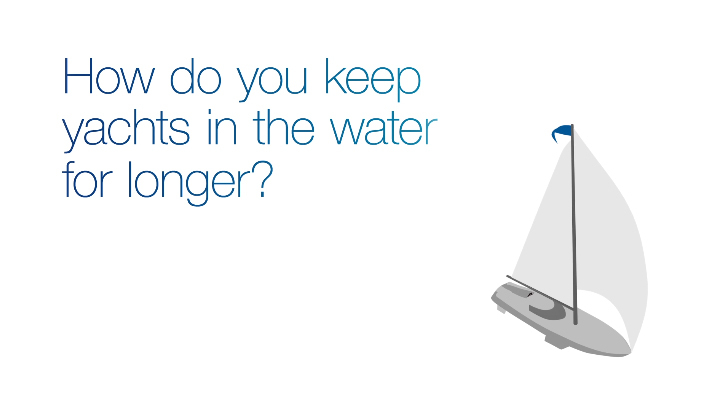 This extended in-service period means that owners can save money as the boat can stay in the water for longer. Designed to be compliant with future legislation, Micron WA is scheduled for an initial launch in France, with a global rollout expected to follow. A patent application has been filed to help maintain technology leadership and promote this innovative new product.